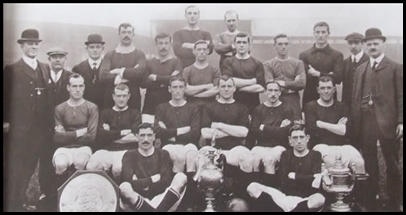 Manchester United football club was originally founded by the railroad workers from Lancashire and Yorkshire Railway in 1878 with the club name being Newton Heath LYR Football Club. Newton Heath LYR played their first home matches at North Road stadium from 1878 until 1893 when the club became more independant from the railway sponsorship dropping the LYR in 1893. 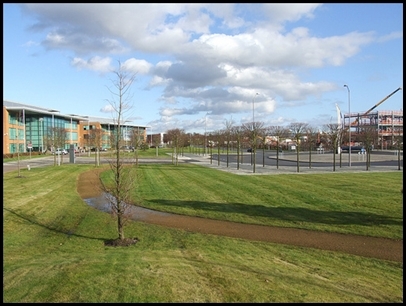 North Road was a multi use soccer field located in Newton Heath, Manchester, England. This soccer stadium was the very first Manchester United home stadium with the club named Newton Heath LYR Football Club during the early days of Manchester United football history. Initially the stadium consisted of only the field with space around it having capacity of about 12,000 standing spectators. Two grandstands were purchased in 1891 to increase the capacity of the stadium to 15,000 spectators. 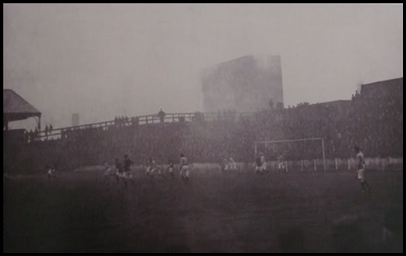 The railroad did not want to pay for these stands which put Manchester United in debt and broke the connection between the railroad and football club even more. By 1893 Newton Heath had lost the sponsorship of the railroad who was paying for the stadium use by the club. Loosing the railroad sponsorship meant that Newton Heath had to look for home elsewhere after being evicted from the North Road stadium in 1893 and the club facing financial difficulties. There ware plans to make North Manchester Business Park on the grounds where once upon a time Manchester United played their home matches. With the club being evicted from their home field North Road, Newton Heath moved to Bank Street stadium in 1893, approximately 3 miles away from the North Road stadium. 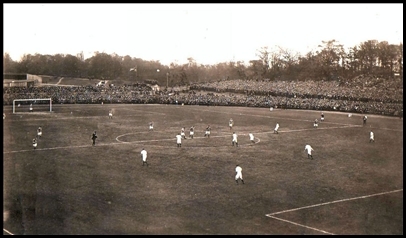 At first the stadium had no stands but by the start of 1893-94 season two stands were added, making the capacity of the Bank Street stadium about 12,000 fans. 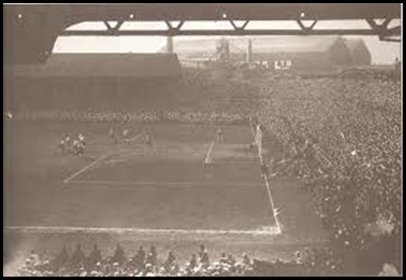 Their first home match on Bank Street stadium was against Burnley on September 1st, 1893 in front of 10,000 spectators. By 1903, following financial difficulty, Newton Heath had a new president J.H. Davies who had the finances and high ambitions for the club. His first order of business was to change the clubs name from Newton Heath Football Club to Manchester United Football Club. With the new president J.H. Davies belief in the clubs success, Bank Street stadium had been expanded by adding stands with covers on all four sides increasing Bank Street stadium capacity to 50,000 spectators by 1906. Following Manchester United's first League Title in 1908 and the FA Cup in 1909 clubs directors decided that Bank Street was too small and too restrictive for the clubs ambitions and growing fan base. 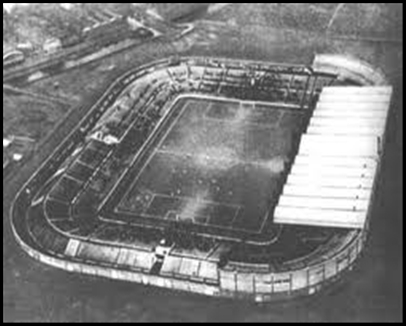 In February 1909 plans were put in motion and Old Trafford as we know it today was named as the new home for Manchester United, following the purchase of the land for around £60,000 and additional budget of £30,000 was given to architect Archibald Leitch for the construction. Bank Street stadium had a lease with Manchester United until January 1st 1912 and the stadium was used by the first team during the Old Trafford construction and than reserve team used it for training and games until the lease expired in 1912. 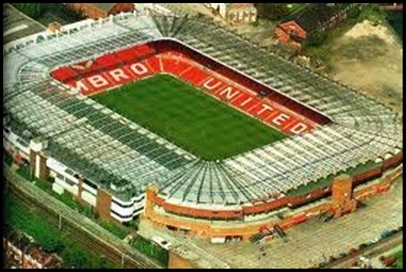 The construction of Manchester United Old Trafford stadium was completed in late 1909 with the capacity of 80,000 fans. 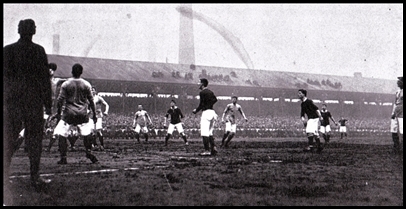 The inagural first match played on Old Trafford was against Liverpool on February 19th, 1910 with Manchester United losing the game 4:3. A journalist at the game reported the stadium as "the most handsome, the most spacious and the most remarkable arena I have ever seen. As a football ground it is unrivalled in the world, it is an honour to Manchester and the home of a team who can do wonders when they are so disposed". Old Trafford became Manchester United Home field as well as one of the top stadiums in Europe hosting many European and English competitions as well. On March 25th 1939, 76,962 people watched an FA Cup semi final between Wolverhampton Wanderers and Grimsby Town marking record attendance up to date. Old Trafford was at the end of bombing in 1940 and 1941 during the Second World War which destroyed much of the Old Trafford stadium. 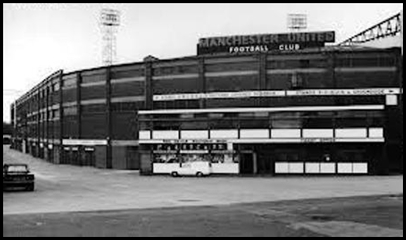 After the war was over, Manchester United received compensation from the War Damage Commission in the amount of £22,278 and while the reconstruction of Manchester United stadium took place, Manchester United played their home games at the Manchester City stadium Maine Road. Old Trafford was reopened after almost 10 years, on August 24th 1949 with a 3:1 win against Bolton Wonderers and in front of 41,000 fans. By 1957 Old Trafford had been added covers for all stands with the addition of a roof to the west stand in 1959. Floodlighting was installed so that European competitions could be played during the night. Pillars that supported the roof on the west stand obstructed the fans view of the field so in time for the 1966 FIFA World Cup, Old Trafford was redesigned again replacing the old pillars with modern style cantilevering on top of the roof, allowing spectators unobstructed view of the field. It is important to mention that Old Trafford stadium is the first soccer stadium in British football history to offer private boxes in 1969. 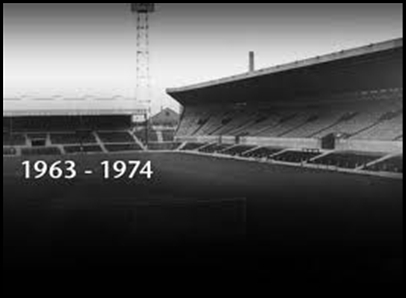 Addition of 5,500 seats in the Scoreboard End in 1973 and the electronic scoreboard in north-east corner along with the completion of the roof around the whole stadium made Old Trafford into a bowl like shape with additional 5,500 seats in 1973. In 1975 more expansion was to be done at the Old Trafford stadium by the addition of the Executive Suite to the main stand with the suite restaurant overlooking the pitch. By 1985 Manchester United stadium had a seating capacity of 25,686 and 56,388 overall capacity with standing spectators. Completion of the cantilever roof allowed for the old floodlight pylons to be replaced by attaching a row of floodlights around the inner rim of the roof in 1987. With the initial capacity of 80,000 spectators declining with all the remodeling done to Old Trafford, by 1980s stadium capacity dropped to 60,000 and by 1990s, with the addition of all seated Stretford End, Manchester United stadium saw an all time low capacity of 44,000 spectators. The clubs success in the 1990s and growing popularity around the world ensured that further development would have to occur to accomodate clubs growing ambition and fan base. In 1995, 30 year old North Stand was demolished and the work on it started right away in time for Euro 96. By 1996 the stadium construction was complete and the capacity of the stadium was increased to 55,000. Further clubs success guaranteed more development first adding a second tier to the East Stand increasing the capacity to 61,000 and than adding second tier to the West Stand increasing the capacity of the Old Trafford stadium to 68,000 seated spectators in 2000. 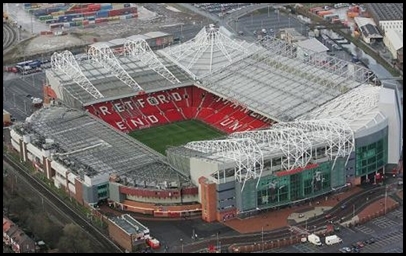 With all the remodeling and expanding done to Old Trafford, the stadium was now not only the biggest stadium in England but the biggest stadium in all of United Kingdom. First major European final at Old Trafford was the 2003 UEFA Champions League Final between Juventus and AC Milan. 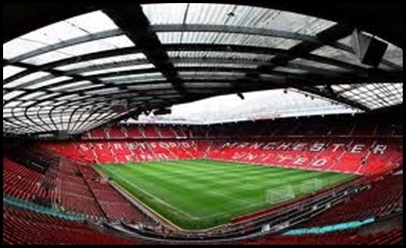 Old Trafford stadium's most recent expansion was in 2006 when second tier seats were added to north-west and north-east parts of the stadium increasing the total capacity to 76,212 seated spectators. In 2009 reorganisation of the seating in the stadium resulted in a reduction of the the stadium capacity from 76,212 down to 75,957 seated spectators. There you have a little history lesson about Manchester United Old Trafford and previous stadiums where this great club started their journey. Please check out my other articles below. Manchester United Old Trafford stadium history. Barcelona Camp Nou stadium history.